Most known for: Pain. Lots of mallet pain. Personality: Alexsi's personality is rather hard to define. Most of the time one meets Alexsi is when she is in a rather sour mood due to some trouble at the inn or some trouble with her brother...though the two cases tend to be hand in hand half the time. Quick to temper, Alexsi is more than happy to use a large mallet she carries as a means of ejecting said problems out the door, and after so many years of practice, she is quite accurate in her aim. Underneath it all is a very sympathetic and caring being who wants all who live around her to be happy. And while she often has to be the voice of reason, Alexsi deep down could not see life without the crazy antics that go around in her inn. History: Alexsi's father, Edward Ti'Fiona, once had a first wife who passed away from unsaid reasons. Because of this, Alexsi has few real memories of her mother and no real mementos save for a large mallet left behind. Edward later remarried a succubus named Destania and unlike most tales of evil stepmothers, Alexsi and Destania got along smashingly well. As her and her younger brother Dan grew up, it seemd Alexsi was going to be the more resposible of the two and it was no suprise that Alexsi inherited the Lost Lake inn and tavern when she got older. While the reasons as to Destania and Edward's leaving are still a mystery, Alexsi has been in charge of the inn for some time now and runs it still today. Quirks/Fun Facts: Alexsi's real mother was named Quintinga and was an amazon. 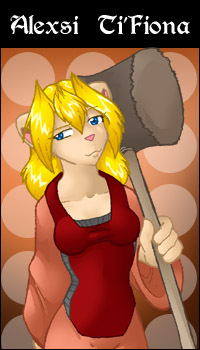 Alexsi's ability to draw her mallet from out of nowhere is similar to Dan's swords. Alexsi collects romance novels, but doesn't read them. Instead she keeps them tucked away in a storage closet. On a sadder note, Alexsi was based off a real life friend's character who passed away on August 23rd, 2004. While the comic Alexsi will continue on, it is a sad loss losing the person who inspired the character. Alexsi's Quote: Ok... who broke what and how?